HAVANA, Oct 25 2013 (IPS) - An end to the country’s dual-currency system is one of the reforms most anxiously-awaited by Cubans, who nevertheless reacted with scepticism and doubt to the announcement of a timeline for eliminating the system, blamed for exacerbating social inequalities in the country. “They are not giving any details of how it will be done, or when. It’s as is they just wanted to tell us that something is being done about this problem,” an accountant who wished to remain anonymous told IPS. 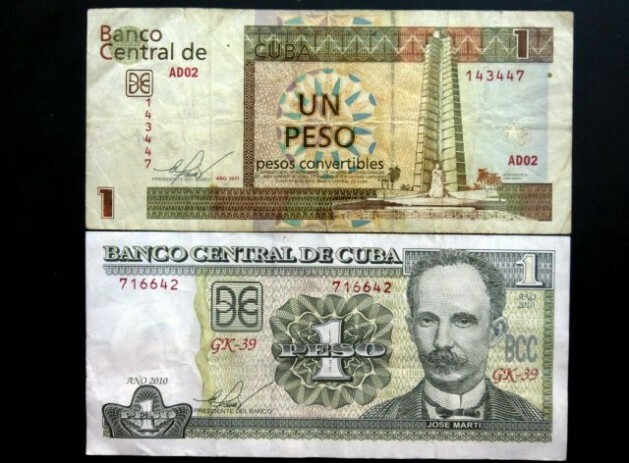 Since 1994, Cuba has had two official currencies – up to 2004, the Cuban peso and the U.S. dollar; since then, the peso and the hard currency convertible peso, or CUC, which replaced the dollar. The CUC, which is pegged to the dollar, is worth 24 pesos. Omara, a 73-year-old pensioner who preferred not to give her surname, said that she gets by on her 240 peso (10 dollars) pension and remittances from her three children who live abroad. Healthcare and education are free in Cuba. Medina also has a guaranteed basket of basic food products at prices heavily subsidised by the state. While insufficient, these goods are a big help to low-income families. However, unlike Omara, Medina cannot get the rest of her basic needs met at the stores that only accept the hard currency CUCs. On Oct. 22, the Cuban government announced that a series of measures would start to be taken to unify the country’s currencies and exchange rates, and acknowledged that the end of the dual-currency system would not be the end-all solution to the country’s economic problems. Nevertheless, it is “essential to ensuring the restoration of the Cuban peso’s value and of its functions as money, that is, as a unit of accounting, payment, and savings….This will bring order to the economic environment and, consequently, provide an accurate measurement of its performance,” it added. Cuban economist Pável Vidal, a professor at the Pontificia Universidad Javeriana, in Cali, Colombia, said the most significant aspect of the announcement was that it indicated that the process would “finally” begin. The government said the changes would start with the business system before being expanded to the rest of the population, whose savings accounts will not be affected, Vidal told IPS. That will involve a gradual devaluation of the Cuban peso for businesses – which currently use an exchange rate of one peso for one CUC – to the current exchange rate that applies to the population at large: 24 pesos per CUC, Vidal said. Nevertheless, “many details remain to be worked out that would indicate the scope of the measure and to what extent the nominal devaluation of the exchange rate would be a real devaluation,” he added. The correction of the exchange rate and the elimination of the dual-currency system would make companies’ financial statements more transparent, and would clarify national accounts and the state budget, Vidal said. “Moreover, it would show that the dual currency system is not responsible for the low purchasing power of wages or for inequality, and that these are both structural, not monetary, problems,” Vidal said in an email from Colombia. Beatriz González, who used to work as an accountant at a factory, says the dual currency system made her job very complicated. “It was crazy. I had to keep one set of books in pesos and another in hard currency. Every operation had to be done twice. Currency unification will be beneficial for businesses,” she told IPS. But González wonders whether wages will go up and the exchange rate of CUCs for pesos will go down at the currency exchange houses. The official response is that wages can only go up if labour productivity rises first. Possession of hard currency by Cubans was decriminalised in August 1993. At that time, it became possible to open a bank account in U.S. dollars, and chains of state-run stores were set up for retail sales in dollars. Four months later, the convertible peso or CUC was created. Between 1989 and 1993, GDP fell by 35 percent; more than 80 percent of foreign trade was lost; fuel consumption was cut by more than half; and external sources of financing dried up almost completely, due to the collapse of the Soviet Union, which the Cuban economy depended on heavily. During this period, inequalities and pockets of poverty grew in this Caribbean island nation. Amid the severe economic recession, Cuban authorities decided not to check the flow of income from tourism, remittances, foreign investment, exports, and others from abroad. Dollarisation benefited both the development of the tourism industry and foreign investment. Still today, the state pays wages and pensions in Cuban pesos, which can be used to pay for basic public services, tickets for cultural and sporting events, some manufactured products, food at farmers’ markets, and subsidised products that families receive through their ration books. Since 2004, the CUC is the only hard currency in circulation, and it is used to pay for services such as cell phones and the Internet, and to buy better-quality products at the chain of hard currency stores, including home appliances, furniture and other domestic goods. Currency unification is one of the reforms with which the Raúl Castro government intends to modernise the national economy to advance toward a “prosperous and sustainable” model of socialism. With reporting by Ivet González.